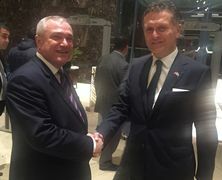 Embassy of the Republic of Turkey to the Republic of Azerbaijan gave an official reception on the occasion of 92nd anniversary of Turkey`s Republic Day in Baku, on October 29. During the reception, Mr. Mircea Ciopraga, Secretary General of the PS IGC TRACECA expressed his gratitude to H.E. Mr. Ismail Alper Coşkun, Ambassador Extraordinary and Plenipotentiary of the Republic of Turkey to the Republic of Azerbaijan for the invitation and congratulated on the 92nd anniversary of Turkey`s Republic Day. As the member-country of the IGC TRACECA since signing of the Basic Multilateral Agreement (MLA) Turkey makes an important contribution to the development of the international transport corridor Europe-the Caucasus-Asia. It should be mentioned that the Republic of Turkey took the Presidency in the IGC TRACECA on 29th of January 2015 during the 11th Annual Meeting of the Intergovernmental Commission TRACECA, held in Istanbul.